On Sunday morning (June 7, 2015), I took these photos of Lake Iseo in Franciacorta. 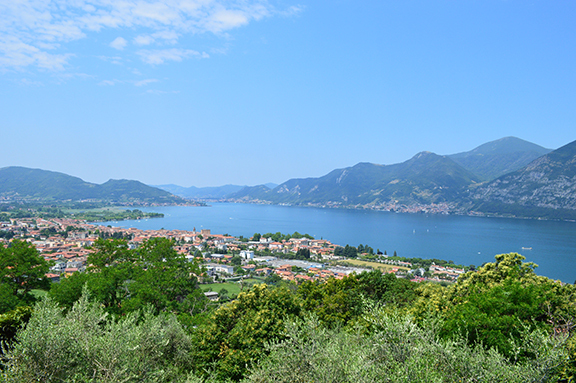 The top photo was shot on the road that leads from Iseo village to Polaveno. 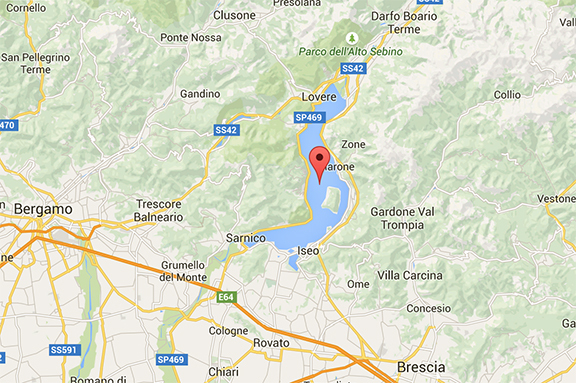 If you look at the Google map below, you’ll see the village of Gardone Val Trompia (to the east of the lake). Polaveno is one of the villages that you pass through on the road to Gardone. Here’s the link to the Google map. Then I drove north to south through the appellation down to Monte Orfano and shot this second photo. In the Google map, look for the village of Cologne toward the bottom. It is one of the hamlets that like on the south side of the mountain, which marks the southern border of the appellation (the mountain is green in the map). Throughout northern Italy, there has been a heat wave this week, with temperatures reaching 86° F. by mid-afternoon. It’s way too early to judge whether or not 2015 is going to be a “warm” vintage. But there’s no doubt that the vegetative cycle is developing more rapidly than in a cooler and more classic vintage. The most amazing thing about my itinerary that day was how the temperature in Franciacorta was markedly lower than Brescia, where I woke up that morning around 7:30 a.m. and left my hotel around 11 a.m. The heat there was really unpleasant and everyone was griping about it. Air currents cooled by beautiful Lake Iseo (isn’t it gorgeous?) 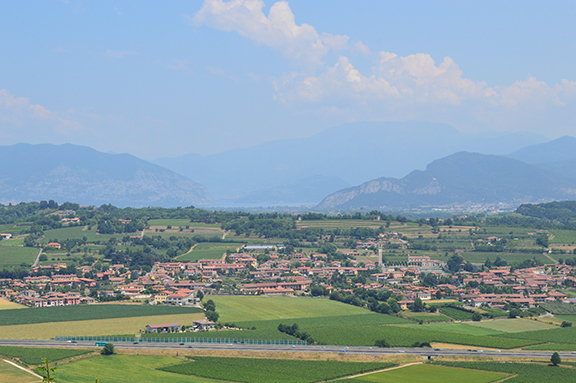 help to keep the vineyards cool during hot summer months, as does the air currents that arrive from the Alps (especially in the eastern part of the appellation). I am planning on visiting Franciacorta around harvest time in mid-to-late August and I’ll be monitoring the temperatures and weather conditions carefully as growers gear up for harvest.